From the Bray country in Normandy, this cheese is a classic, and one of the oldest coming from the region. Neufchâtel Fermier has been in in the business of seduction for nearly a thousand years, with written reference dating back to the year 1035. They must be doing something right. Currently four farms and two co-ops are authorized to produce the real thing, its name and origin protected by official decree since 1969. One of the special characteristics of this full fat raw cow's milk cheese, aside from the deliciously provocative shape of the moulds, is the way they coat it with a layer of finely ground sea salt after pressing, a step meant to control the flowering of the mold applied to the outside, a type of penicillin. This step gives a pronounced salty flavor to the cheese. Neufchâtel Fermier is consumed in its local region as young as 12 days after being pressed, but here in Lyon, we normally see it aged from 1-3 months. Locals like it with cider, or a round wine to compliment the salty taste and bring out the flavor. When ever I read one of your cheese posts I have to raid our own stash. This sounds so good, salty cheese, yummm. They have a Neufchâtel at the grocery store but I suspect it is NOTHING compared to what you're describing. Is this a soft creamy cheese? It is most probably a version of the cheese above, Tace. 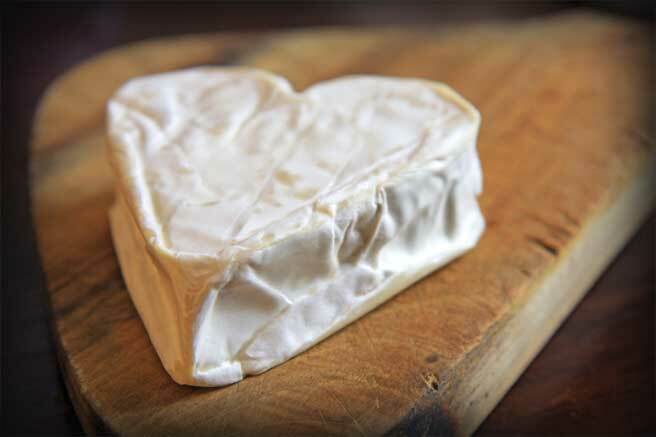 Well our grocery store Neufchâtel is tasty, we buy it instead of cream cheese sometimes, but it doesn't come in a pretty little heart shape with salt. Just discovered your blog today and fell in LOVE with your photography! I immediately added you to my sidebar so that I wouldn't miss any future posts! Is there anything better than French cheeses with a good crusty bread and a glass of "round" wine??? Friend Jo who bought this cheese with me said that apple juice is a wonderful compliment to this cheese. If we only had any left, I would try it out. Best not to put another one of these on the cheese plate, it calls a siren song that is almost impossible to resist.